When space is at a premium, using large storage bins to hold your refuse isn’t a sensible use of your resources. That’s where UK Chutes’ range of waste compactors comes in. We carry a full range of Harpac commercial, static, portable, chute fed and catering compactors, which are designed to link up with your refuse chute systems and reduce the volume of waste created by industrial, commercial and residential buildings. After a consultation, we’ll recommend one of the following compactors, based upon your building’s needs, requirements and refuse volumes. For the full technical specifications of any of our compactors, please contact UK Chutes today. 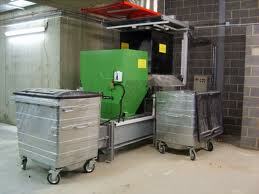 We’ll discuss your requirements and suggest the correct compactor for your needs.